11 MarNew star in the publishing sky? Gabriel Nicolás Mendieta Correa – sounds Spanish, but is German. Freiburg im Breisgau (Germany) is the seat of a new publishing house: The music publishing house Mendieta was founded by Gabriel Nicolás Mendieta Correa and distributes various works for wind orchestra. Special emphasis is among other things the treatment of film and Videospielmusik, as well as transcriptions of traditional songs. The founder’s name sounds Spanish, but he was born in Freiburg. 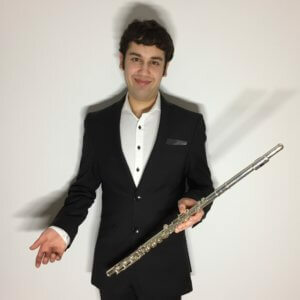 As the child of a family of artists, he was involved in the constant exchange of music from the very beginning and received his first flute lessons from 2007 onwards from his father, music director Alfredo Mendieta. In the following years he recognized the talent for the transverse flute, whereupon he prepared him for the life of a professional musician and also sent him to competitions (Bundespreis bei Jugend-musiziert). He also benefited from the cooperation of his school with the then SWR Orchestra Baden-Baden and Freiburg, where he actively participated in the premiere of Manos Tsangaris‘ “Freigehege”. Since the winter semester 2015/2016 he studies flute at the Staatliche Hochschule für Musik Trossingen with Prof. Gülsen Tatu and wind orchestra conducting with Alexander Beer. Among other things, he took part in a master class with Prof. Dr. John Pasquale in conducting. Already during his studies he was able to gain first experiences in orchestral conducting, as well as in the direction of a wind orchestra by his father. He conducted the Chilean police orchestra “Orfeón nacional – carabineros de chile” in 2018.